I am so excited to finally announce that I will be spending three magnificent weeks in Sierra Leon observing chimpanzees this summer. It has been a while since I published a personal post, since I have been waiting to hear back from a few different institutions regarding my future in primatology. But now that I am pumped full of excitement and vaccines, I think that it is safe to share a little bit about the Tonkolili Chimpanzee Project in the Tonkolili District of Sierra Leon in Western Africa. 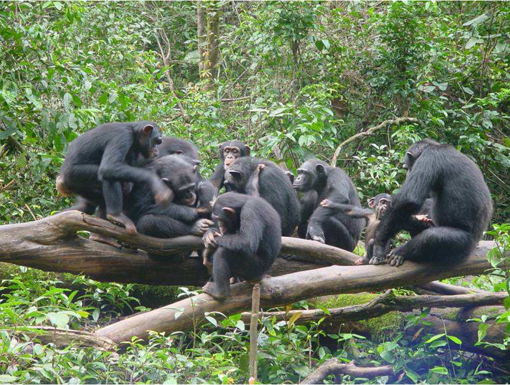 Chimpanzees in Sierra Leon. Photo courtesy of the Arcus Foundation. If you’re still not quite sure where Sierra Leon is, here is a map. As a Floridian I knew it as the area where hurricanes are born, but it is quite a bit more than that. Sierra Leon is near the equator and boasts a warm and tropical climate all year round. It’s capital, Freetown, which was originally a major port for exporting slaves, became a city of refuge for freed slaves by the British Empire. The city is even mentioned as a stop on the journey of the ship in the story “Tarzan of the Apes.” But the country’s most recent history is mostly concerning the civil war that ravaged the entire country. It lasted from 1991 to 2002 in which more than 50,000 people died and 2 million people were displaced as refugees. Though the country is now stable, it is still suffering from the destruction of its infrastructure. Sierra Leon is home to pygmy hippopotamus, African bush elephants, bongo, red river hogs, and, or course, chimpanzees. Since the war the people in the Tonkolili districts in Sierra Leon have been farming palm plants, which is a favorite food of the neighboring chimpanzee troop. This has created a very bad situations for both parties, as the peoples only source of income is eaten by the chimps and the chimps are in turn, hunted as a form of pest control. In previous journeys to Sierra Leon, Lynn University’s Andrew Halloran and the University of Utah’s Tina Cloutier have, with the help of Lynn University, shipped over about 10 wooden bee boxes as an alternate source of income. It is their hope that cultivating honey will help alleviate some of the pressure to hunt chimpanzees. It is stated by Lynn University that the Tonkolili Chimpanzee Projects larger aims are to supply the villages with livestock, seeds for planting and an educational program for villagers. 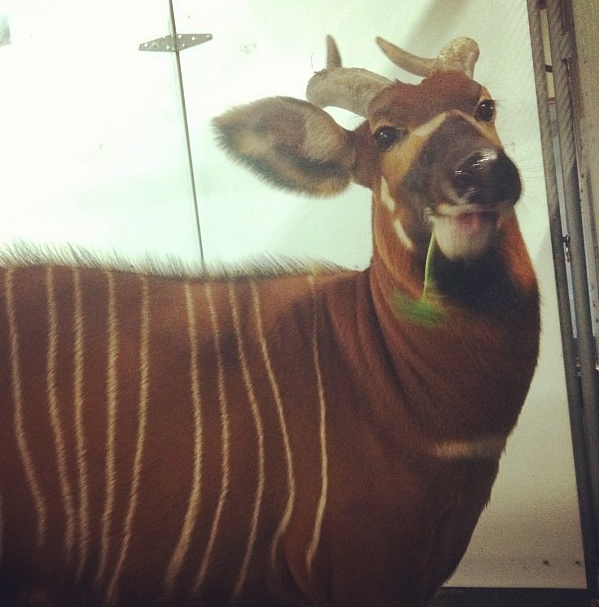 I just had to add in this adorable photo of a Bongo I took at the Dallas Zoo BTS. A phrase that has stuck with me, whether because I heard it repeated about a hundred times while working at the Dallas Zoo, or because truer words were never spoken, is that villagers are not going to give a damn about conservation is their families are starving. This was said by Cheetah Conservation Fund’s Laurie Marker, and the reason I’ve heard it so many times is because she filmed a short conservation speech that played on a loop at the Dallas Zoo in one of the building I worked. If the people of the Tonkolili district are poor and starving because the chimpanzees are munching on their only source of income, they won’t think twice about killing it. If an alternative can be found to provide income that doesn’t tempt the chimps, then after some time, a happy equilibrium can be established. Not only is the conservation of the chimpanzees highly important, but the project also hoped to shed a light on this newly discovered population of chimpanzees in central Sierra Leon. In Halloran, Cloutier and Papanie Bai Sesay’s(of the Conservation Society of Sierra Leon) article in the American Journal of Primatology they estimated a group size of about 30 individuals that lived well out side of a protected area. 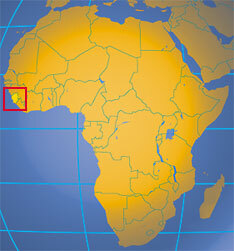 Throughout the article they document the known chimpanzee populations, climate, economy, and geography of Sierra Leon. Together all of this information can be used to create new conservation strategies that can be used to help the chimpanzees living along side villages and outside of protected zones in Sierra Leon. I am very excited for the opportunity to be a part of such an amazing conservation project. Not only that, but it will be my very first time in Africa! I will post in depth about my trip once it is over, but I will not have access to internet during. But you will still have to wait since I don’t even leave until May! I am just so ecstatic and I can’t wait to share more about my journey to Sierra Leon once I’m back state-side. For more information on the Tonkolili Chimpanzee Project click here. Thank you so much! I am beyond excited and I can’t wait to share my journey on this website! How are you volunteering for the project? That sounds like a great cause! I’m not volunteering! It’s a field study so I’m going as a researcher. There are a few undergraduate researchers and the project is being headed by two PhD’s. But there are plenty of volunteer programs where you can do primate research. OUTroop works with orangutan conservation and you can volunteer to be an orangutan behavior researcher for 7 weeks, this is the same with OFI (Orangutan Foundation International) but their program is 6 months. There are also various programs throughout South America, but I’m not nearly as aquatinted with them. Congrats! What a wonderful opportunity — enjoy your time there! Thank you! I hope that you will follow and read my wonderful updates when I get back from the field! I will definitely! I’ve been making my way through your blog and I’m enjoying it very much! Thank you! A new reader is always greatly appreciated! !